Gerald Farringdon has always had it all: looks, charm, career… the list goes on. But when a bad business deal turns the world of his brother upside down, Gerald learn that maybe he just doesn’t have everything. 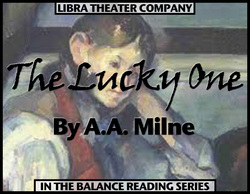 Written by the author of the beloved classics Winnie-the-Pooh and The House at Pooh Corner, The Lucky One is a delightful British romp that explores the humor and the drama of family, love, and a bit of golf obsession.